A total of 6,151 candidates from 21 registered political parties and 201 independent groups are contesting the Sri Lankan Parliamentary elections scheduled for August 17, 2015. Of these 3, 653 are from the 21 parties and 2,498 from independent groups. Predictably the spotlight in general has been on the major political parties both nationally and regionally. However a particular group of Independents contesting in the North has also attracted much attention. This is because the group comprises former members of the Liberation Tigers of Tamil Eelam (LTTE). An assortment of ex-tigers is contesting the Parliamentary poll in the Jaffna electoral district as the Independent Group No 4. Since the Jaffna electoral district consisting of the Jaffna and Kilinochchi administrative districts is returning only seven elected members of Parliament this time due to its decreasing population, the candidate list has ten persons. The independent group no four has been allocated the spider as its symbol. Of the ten candidates in the list only one has not been a member of the LTTE. He is Nadesapillai Vithyatharan former Editor of the Tamil newspapers “Uthayan” and “Sudar Oli” published in Jaffna and Colombo respectively. ‘Vithi’ as Vithyatharan is popularly known is the accredited leader of the Independent group. The others in the list are Sivanathan Navindran alias “Venthan”, Ganeshalingam Chandralingam alias “Thulasi”, Rasiah Tharmakulasingham alias “Gamini”, Kalikkutti Subramanian alias “Charles”, Kumaravelu Akilan alias “Iyal”, Thangarasa Thevathasan alias “Gangai Aathman”, Vinayagasundaram Mohanasundaram alias “Gangai Alagan”, Veeran Sakthivel alias “Thani Arasan”, and Sivaguru Murugadas alias “Raviraj”. All of them are former cadres of the LTTE who were detained after the war ended in 2009. They were released after undergoing rehabilitation. Some of them who had lost a limb and were disabled had received priority in being released. Many of the candidates contesting as spiders carry pieces of shrapnel in their bodies still. Among the candidates, Navindran alias Venthan has been very much in the news lately with several newspapers highlighting the fact that the ex-Tiger had been a bodyguard of former LTTE supremo Veluppillai Prabhakaran. Venthan who lost a leg in the war had been a member of the “Vaan Puligal” (LTTE air wing) as well. Chandralingam alias Thulasi had been in the LTTE’s administrative secretariat. Tharmakulasingham alias Gamini was in the LTTE’s “Charles Anthony infantry brigade” and led a combat unit. Subramanian alias Charles had been a gunner in the LTTE’s “Kittu” artillery corps. Akilan alias Iyal had worked as a computer operator for the LTTE’s educational development secretariat under “Baby”Subramaniam. Of the others, Thevathasan alias Gangai Aathman had been an intelligence operative working under the dreaded LTTE intelligence chief “Pottu Ammaan”. Mohanasundaram alias Gangai Alagan had been an officer in the “Kaaval Thurai” or LTTE Police force under its former “chief” Nadesan who later became LTTE political commissar. Sakthivel alias Thani Arasan had been working in the LTTE radio “Puligalin Kural” or “Voice of Tigers”. Murugadas alias Raviraj had been attached to the LTTE’s economic development wing known as TEEDOR. As stated earlier, the solitary exception is journalist Vithyatharan who now runs a Tamil website ”Malarum” and has not been a member of the LTTE. Vithi however describes himself now as an “Oodagap Poaraali” or media warrior. All the ex-LTTE cadres contesting as independents under the spider symbol have completed their GCE O/levels and some have done their A/levels too. Despite being rehabilitated and released after the war, most of these ex-Tigers have found it difficult to re-integrate into society. Economic opportunities too have been scarce. They have also been unable to go abroad as many of their former comrades at arms have done. Against that backdrop the current exercise of contesting an election poses a constructive challenge besides demonstrating to the world that ex-LTTE cadres are embracing democracy and that Tigers are turning into spiders. The driving force behind the “ex-Tigers in elections” project has been Vithyatharan. Though contesting as Independents, they belong to a newly formed organization called “Jananaayagathukkaana Poaraaligal” (Warriors for Democracy) in Tamil. However, those involved in the organization describe it in English as “Crusaders for Democracy” (CFD) and most English media organs describe it as such. This is reminiscent of the ‘word games’ played by Tamil politicians in the past. For instance when the “Ilankai Thamil Arasuk Katchi (ITAK) was formed in 1949, the party was depicted as the “Federal Party” (FP) in English. A direct translation of the Tamil name into English would have been (Ceylon Tamil State Party). When this discrepancy became known, it led to much suspicion among Sinhalese who thought the party wanted to create a separate Tamil State under the guise of Federalism. This paranoia about Federalism still remains in certain circles. The announcement about the Crusaders for Democracy (CFD) being formed was made in early July outside the famous “Nalloor Kandaswamy” (Murugan) Temple in Jaffna. There was a certain symbolism in this too. It was at the Nalloor Kandaswamy temple’s vicinity that the LTTE’s former Jaffna district political chief Rasiah Paarthiban alias “Thileepan” conducted his death fast in 1987. He passed away on September 26. When Vithyatharan along with other ex-Tigers assembled at the Nalloor Temple, reference was made to Thileepan and his fast unto death. The formal announcement about the CFD was made after a period of silent meditation at the temple premises. About 25 to 30 ex-Tigers were present. Apparently the idea to form an organization of ex-LTTE cadres came into being after a series of quiet discussions at different places among former Tiger members. As stated earlier these discussions were initiated due to the efforts of Vithyatharan who played an important and crucial role in forming the CFD. Apart from heading the independent group 4 list, Vithyatharan is also functioning as the co-ordinator of the new organization. It is said that Vithyatharan would bow out gracefully after the CFD was well established. The administrative secretary and spokesperson in Tamil for the CFD is Rasiah Kirubaharan alias Kathir who also lost a leg in the war. The LTTE in 1989 formed a political party. This was during the time of President Ranasinghe Premadasa when there were talks between the Govt and the LTTE. The LTTE formed a political party to demonstrate that they were sincere in peace talks and entering the democratic mainstream. It was an act of deception. The LTTE formed the People’s Front of Liberation Tigers(PFLT) to hoodwink Premadasa and the pro-peace lobby that it was genuine about embracing democracy. The birth of the PFLT was announced at the Galadari Meridien hotel in Colombo. Ex - LTTE deputy leader Gopalaswamy Mahendrarajah alias Mahathaya was the President and former Tiger political commissar Yogaratnam Narendran alias Yogi was the General Secretary. The PFLT held a convention at Vaaharai in the Batticaloa district. It was also given “observer” status at the All-party conference. War broke out between the Govt and LTTE in June 1990. The PFLT was dissolved a few years later on the orders of Tiger supremo Veluppilai Prabhakaran. The PFLT’s President Mahaththaya was detained, tortured and executed on concocted charges of treason. PFLT secretary Yogi was also detained for a long time and subsequently released after intensive interrogation. This was the sad story of the LTTE’s political party. The warriors or crusaders for democracy take great pains to emphasize that they are not in any way trying to revive or resurrect the LTTE or the PFLT. The CFD says that they have now taken to democracy and that the door has been shut on their LTTE past. The CFD wants the Tamil people to believe that their party has an organic link to the LTTE and that the politics they do is only an extension of LTTE politics without arms. At the same time the CFD wants to convince the rest of Sri Lanka and the world that they have broken completely with the violent past of the LTTE and that they have turned from growling tiger carnivores into purring herbivore felines. The CFD wants to assert its Tiger image because it thinks that will help it to garner more Tamil votes but it also does not want to be perceived as a new avatar of the old LTTE. This dilemma faced by the CFD is well illustrated by its usage of “Poaraali” or warrior in Tamil and Crusader in English. Yet the CFD displays a tendency to draw on its “Tiger legacy” for political purposes whenever or wherever possible. 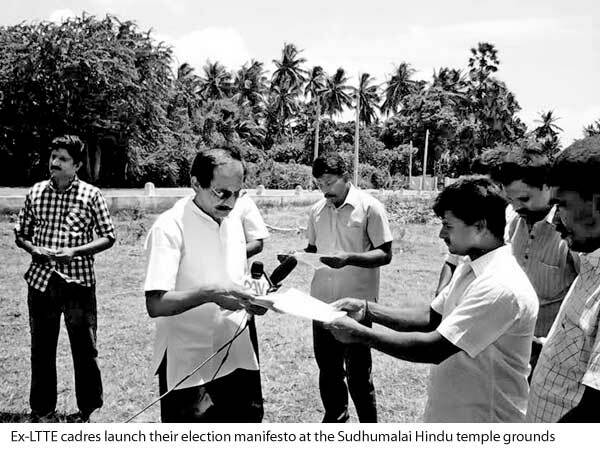 For instance, the CFD that announced its formation at the Nalloor Kandaswamy temple premises in July chose to release its election manifesto on August 4 at the Suthumalai Amman temple. Again there was symbolism in the move. The Indo-Lanka accord was signed on July 29, 1987. The accord stipulated a farewell to arms by the Tamil militant groups including the LTTE. It was on August 4, 1987, that LTTE leader Veluppillai Prabhakaran announced that the LTTE was ending its armed struggle at a public meeting. The venue was the Suthumalai Amman temple “mundral” or compound. 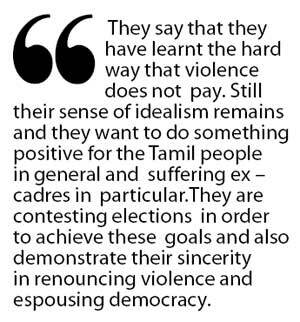 The CFD in a bid to evoke memories of the LTTE past, planned to hold a public rally at the Suthumalai Amman temple vicinity and release its manifesto. Since political meetings cannot be held under elections laws at the premises of religious places of worship, the Manipay area Police refused permission for the rally. So the CDF merely released the manifesto in a low key event at the Suthumalai temple premises. Some of the attempts by the CFD to draw on its Tiger-legacy and gain authenticity have been jocular and somewhat puerile. The CFD selected the spider as its election symbol and then added a twist for Tamil consumption. CFD announced in Tamil that they have obtained the “Pulimuhach Chilanthi” (tiger faced spider) as its symbol. The species referred to as Pulimuhach chilanthi is none other than the tarantula. Film goers who would have seen the James Bond thriller “Dr. No” may recall the tarantula sent by the bad guys crawling over a sweating Sean Connery. The tarantula is referred to as tiger-faced spider in Tamil on account of its striped design. There are seven kinds of tarantulas in Sri Lanka. One that was discovered at Mankulam in the Northern province by Ranil Nanayakkara in 2012 has been named “Poecilotheria rajaei” or the Mankulam pink banded ornamental tarantula. What is interesting is that the elections dept symbol is not a tarantula but simply a plain spider. It was only the spider which was allocated to the CFD. However the ex-Tiger outfit in an infantile attempt to impress the Tamil masses claimed that the election symbol was a tiger-faced spider or “pulimuhach chilanthi”. This type of political stunt was pulled by the Tamil United Liberation Front (TULF) in 1977. The newly-formed TULF asked and obtained the “sun” as its symbol. This was the symbol that had been given the Sri Lanka Freedom Socialist Party (SLFSP) led by CP de Silva in 1965. However, the TULF claimed it had got the “Uthayasooriyan” or rising sun as its symbol instead of saying “Sooriyan” or sun. This was because the Dravida Munnetra Kazhagham (DMK) in Tamil Nadu had the rising sun as its symbol and there were many Tamil songs praising the uthayasooriyan symbol party. The TULF wanted to cash in on that and did so very well. The CFD was perhaps trying to emulate the TULF when it tried to identify with the “Puli” or Tiger when it called its spider “pulimuha” or tiger faced. Another gimmick by the CFD to identify with the LTTE of Prabhakaran indirectly has been the opening of an office in the coastal town of Valvettithurai in addition to its main office near Jaffna Hindu College at Vannarpannai in Jaffna town. Valvettithurai or VVT is the hometown of Tiger supremo Veluppillai Prabhakaran. The CFD office is situated very close to where Prabhakaran’s ancestral abode was. The house is now demolished and its compound over run with weeds and wild grass. Still there is again much symbolism in having an office in VVT near the house of “Thesiya Thalaiver”(National leader). The CFD election campaign is now underway in Jaffna. The candidates exude an impression of being strapped for funds. The manner and mode of the CFD campaign is in stark contrast to the well – heeled campaigns of other parties. The CFD candidates and their supporters consisting mainly of ex – LTTE members rely mainly on house to house canvassing. They distribute leaflets to each house and engage in conversation with the family members. They also sell copies of the book written by Nadesapillai Vithyatharan saying the proceeds are for the CFD campaign. Vithyatharan has been in journalism since 1979. He wrote a book about his experiences as a journalist called “En Ezhuththaayutham “in Tamil. A direct translation would be “My writing weapon” but the author has called it “My pen, my weapon”. The book was released in Colombo in November 2014; among those who spoke at the event were then Opposition and UNP leader Ranil Wickremesinghe, TNA leader Rajavarothayam Sampanthan and Muslim Congress leader and then Justice Minister Rauff Hakeem. The book was also released in Oslo in February this year. It was while speaking at this event that Vithyatharan first revealed that moves were on to form a democratic political movement and party comprising former members of the LTTE. After Vithyatharan’s return to Sri Lanka there appeared to be no forward movement on the matter until early July this year. It was then that the formation of the CFD was announced to the world. According to some residents of Jaffna, the CFD’s style of campaigning has evoked much sympathy among the people. Small groups of ex-Tiger cadres, including those who have lost limbs, walk into residences, speaking extremely politely in Tamil. They speak of how they had sacrificed everything to achieve political liberation for the Tamil people and how all hopes were dashed. They say that they have learnt the hard way that violence does not pay. Still their sense of idealism remains and they want to do something positive for the Tamil people in general and suffering ex – cadres in particular. They are contesting elections in order to achieve these goals and also demonstrate their sincerity in renouncing violence and espousing democracy. There was a time when many Tamil people hated the LTTE for their arrogance and show of power. Reasonable dialogue was virtually impossible and conversations were monologues with the LTTE doing the talking. But now things were different. The end of the war and ushering in of democracy has empowered the ordinary Tamil people. So the roles were somewhat reversed in these conversations and discussions. The plight of the ex-Tigers also aroused sympathy. Most were in shabby clothes and appeared rather ill-Kemp which was a far cry from the days when the LTTE ruled the roost. They were quite unprepared for the hospitality showered upon them by the people who offered them food and refreshments. In some instances, clothes were given as gifts. Some people even provided transport when required. The Crusaders for Democracy Independents reflect the spectrum of Jaffna-society with candidates being drawn from diverse social backgrounds. None of the candidates was a noted or was a well-known personality during their stint with the LTTE. The bulk of the candidates are from the Vadamaratchy region. They are in their thirties or late twenties. Around 50 to 60 ex-Tigers are working full time as canvassers for the Independent group. They are provided food and a small allowance. Transport is a huge problem as they seem to have only a few vehicles at their disposal. The CFD claims that members of the public are helping out in many instances by providing support. Donations of cash and kind are also being received from the public at large says the CFD. Vehicles also are being lent. Knowledgeable sources connected to the Crusaders for Democracy revealed that their chief financier was a Tamil entrepreneur from Britain. This man whose real name is a closely-guarded secret is called “Tamil CNN Kannan” because he ran a website in London by that name under the nom de plume Kannan. It is now being run by some other persons. Kannan, whose family is in the UK ran several commercial ventures in Britain. He wound up most of his businesses in London and relocated to Sri Lanka a few years ago. Kannan hailing from Irumbumathavaddy in Karaveddy in the Jaffna peninsula commenced several business enterprises in the North after returning home. Chief among these was a construction and transport company. While Kannan remained in the background, his front man in running the businesses was a kinsman Yathavan Somasuntharam who is known publicly as Selva. Yathavan, a resident of Maalusanthi in Karaveddy has a BSc degree but has been engaged in business pursuits. The Kannan-Selva combine has maintained excellent relations with the defence establishment in Sri Lanka. It was this “influence” which enabled the Kannan-Selva combine to excavate sand in large quantities from the Vallipuram in the Manalpiddy area in the peninsula through an enterprise named “Neithal”. EPDP leader Douglas Devananda through the “Maheswari Nithiyam” organization had a “monopoly” over sand during the Rajapaksa regime. Yet, the Kannan-Selva combine was able to defy Devananda and engage in the sand business due to greater influence with the defence establishment. The duo also started a reconciliation centre in Jaffna to promote ethnic harmony and peace. The reconciliation centre distributed application forms for those seeking employment in the Govt sector. Apparently the Kannan-Selva combine has rendered yeoman service to the Crusaders for Democracy by providing two financial grants so far. According to informed sources, 1.5 million rupees was paid in the first instalment and in the one million in the second. Two vehicles were also provided. As is typical, Kannan remains in the background while Selva is the up front man in their business dealings. In this instance, however both Kannan and Selva are careful not to identify themselves publicly in any way with the Tigers contesting as spiders. Another issue of interest has been the involvement of journalist Vithyatharan in this exercise. Why is a former Tamil newspaper editor playing Godfather to a group of ex-LTTE cadres contesting polls? 56-year-old Vithyatharan was a controversial journalist who moved closely with the LTTE as well as Govt and security circles in his capacity as the Editor of the Jaffna-based “Uthayan” and Colombo-based “Sudar Oli”. Both newspapers were owned by his brother-in-law and managing director Eeaswarapatham Saravanabavaan. Vithi was also in touch with diplomats from different countries in Colombo . Establishing contact and maintaining cordial relations with a wide range of sources is very essential for a journalist. Some journalists however go beyond the call of duty as a professional journalist and engage in extra-journalist missions at times. These are justified by them as being in the national interest. Vithyatharan also was involved in such extra-journalist missions and often adopted an emissary role between different parties. These missions were known only to a few at a higher level with others being in the dark. Vithyatharan has revealed some details of his extra-journalistic missions in the book written by him. Vithyatharan was “white-vanned” on February 26, 2009, while attending a funeral in Mt.Lavinia. Initially the Police spokesman called it an “abduction by unknown persons” but later it transpired that Vithyatharan had been arrested and not abducted. He was detained at Dematagoda by the Crime Detection Bureau for two months and interrogated . His wife was allowed to visit him and supply home- cooked meals regularly. It was stated that he was being questioned over suspected links with the LTTE and for allegedly co-ordinating attacks by the Tiger air wing in and around Colombo. Former Defence Secretary Gotabaya Rajapaksa then stated that Vithyatharan was a “terrorist” and had played a part in co-ordinating the LTTE air attack over Colombo on Feb 20, 2008. When an Australian journalist raised the issue with him, Gotabaya responded by saying that anyone speaking on behalf of Vithyatharan would have “blood on his hands”. Against that backdrop many thought that Vithyatharan would be incarcerated for a long time but he was released after two months. Vithyatharan was produced on April 24, 2009 at the Colombo Magistrates Courts where the Police said that there was no case against him. Vithyatharan was discharged and walked a free man. It was then said that President Mahinda Rajapaksa himself had intervened in the matter and got Vithyatharan released despite objections by his brother. Later on May 2, 2009, Vithyatharan filed a fundamental rights petition against Gotabaya Rajapaksa and five others over his arrest and detention. Events however moved fast and by mid May 2009, the LTTE was defeated militarily. The climate in the country changed drastically. In a changed environment Vithyatharan did not proceed with his FR petition and dropped the matter. After the LTTE was defeated, Vithyatharan began to identify himself with the Tamil National Alliance (TNA) in general and the Ilankai Thamil Arasu Katchi (ITAK) in particular. He sought nomination from the TNA for Jaffna District when the 2010 Parliamentary elections. Though Vithyatharan was promised candidacy first, his brother-in-law Saravanabavaan replaced him on the TNA list in a sudden political twist. This caused estrangement between Vithyatharan and Saravanabavaan leading to the former quitting as editor of the two newspapers. Saravanabavaan was elected MP in 2010. Vithyatharan still worked with the TNA and assisted the party in media work. Vithyatharan was a speech writer for many TNA leaders. Vithi claimed credit for writing the Tamil speech made by Sampanthan at the ITAK convention in Batticaloa. Sampanthan’s address was criticized heavily in the South, and thereafter Vithyatharan was eased out of speech writing. He then formed a Colombo branch of the TNA and became its Secretary. With elections to the Northern Provincial Council looming large on the political horizon, Vithyatharan began striving to gain nomination as the TNA chief ministerial candidate. He claimed that New Delhi wanted him to be the Northern Chief Minister. Again Vithyatharan was in for disappointment. Not only was Vithi not made chief ministerial candidate, but he was also denied nomination as even a TNA candidate at the polls. Former Supreme Court Judge C.V. Wigneswaran became TNA Chief Minister. Vithyatharan now started a Tamil website named “Malarum”; meaning flowering or blooming. He used it to undermine certain TNA personalities while promoting others. Vithyatharan adroitly exploited his former schoolmate and literary savant “Kambavaarithy” Jeyaraj and got him to write a series of critical articles about CV Wigneswaran and his poor performance as CM. Soon Vithyatharan began losing interest in his website and began politically “flirting” with former members of the LTTE. He also wrote and released his book. Vithyatharan floated the idea of forming an organization for ex-LTTE cadres and began soliciting support. Though it was proclaimed early this year that the organization would contest polls, nothing worthwhile happened till mid year. After forming the “Jananaayagathukkaana Poaraaligal” (Warriors for Democracy), Vithyatharan approached the Tamil National Alliance and sought nomination for ex – LTTE members on the TNA lists. He wanted two ex-LTTE cadres to be included in the TNA lists for Jaffna, Wanni, Trincomalee, Batticaloa and Amparai electoral districts. The TNA hierarchy declined to oblige. Vithyatharan then criticized the TNA saying the alliance which utilized the “Tiger image” to harvest votes was denying an opportunity for ex-LTTE cadres to re-enter the political mainstream democratically. He said the CFD would contest as independents. Upon hearing this Tamil United Liberation Front (TULF) leader Veerasingham Aanandasangaree who was at loggerheads with the TNA offered nomination to the CFD on his party lists. Sangaree’s offer was spurned. Instead the CFD filed nomination as an independent group for Jaffna electoral district alone. Vithyatharan said they were not contesting in other districts as they did not want to divide votes and dilute Tamil representation. Interestingly the CFD did not request inclusion on the candidate lists of the Tamil National Peoples Front contesting on the ‘cycle’ symbol of the All-Ceylon Tamil Congress. The TNPF-ACTC led by Gajendrakumar Ponnambalam is contesting in all districts of the north and east with the backing of LTTE and pro-LTTE elements in the Tamil Diaspora. It is also noteworthy that many Tiger-controlled media organs in the Diaspora have been critical of the CFD. It is alleged that the ex-Tigers are contesting with the ulterior motive of reducing potential votes for the TNPF-ACTC. At the same time the TNA is also being criticized for not including ex-LTTE cadres in their lists. As for the “spider” candidates, they are also condemning only the TNA for not accommodating them and describing that “betrayal” as the motivating reason for their contesting as Independents. There is no reference to the TNPF-ACTC in their political campaign so far. Vithyatharan’s chequered politics and the circumstances leading to the pivotal role played by him in forming the crusaders for democracy, re-inforce the suspicion that the veteran journalist is pursing a vendetta of his own against the TNA. It is believed he harbours much resentment against the alliance for not fulfiling its promise to nominate him as a candidate for 2010 elections and disappointing him. He is now exploiting the former Tiger members and utilizing them to promote his electoral ambitions it is felt. If the Independent group polls enough votes to gain an MP seat, it is very likely that Vithyatharan would become an MP. Even if other candidates get more preference votes, they are likely to refrain from taking oaths as MPs and clear the way for “Vithi anna” (elder brother Vithi) as MP. It is in this context, therefore that the ex-Tigers are contesting as Independents in Jaffna. They are being received and treated well by potential voters during their house-to-house canvassing. It is however a moot point as to whether the hospitality displayed would translate itself into actual votes on election day. It remains to be seen whether the ex-Tigers contesting as “Independent Tigers” would harvest enough votes in Jaffna on Aug 17 to send Nadesapillai Vithyatharan to Parliament.